I’m a field producer on HGTV’s House Hunters. It really is the best job ever. I travel all over the United States (I’ve been to every state except Alaska!) – and have the great opportunity to see a city literally “behind the scenes”. I have a surprising hobby – I’m a quilter – I always sewed, but I got my first job in TV on a show called SIMPLY QUILTS – and that really ramped up my skill. The conventional wisdom behind hiring me was “It’s easier to teach someone who sews how to produce a TV show rather than teach a producer how to sew.” It’s been 12 years since that show – and I still love to fire up my sewing machine. I was born in Philadelphia, but moved to Los Angeles when I was ten, so I’d have to say I’m a Californian now. I live in Santa Monica with my husband. I like to think I transcend genres. When Kensington bought my first trilogy – which they called THE VENICE BEACH ROMANCES – I was cast in the role of ‘romance writer’ – even though my books were not traditional romances. For me, the protagonist’s journey is every bit as – if not more – important as how “boy gets girl.”By the time Kensington-Lyrical started talking to me about my second trilogy – THE WELCOME TO FAT CHANCE, TEXAS BOOKS – they thought perhaps “women’s fiction” might be a better mantle. I’m grateful and excited to just be in the “published” genre. Print money and not get caught. I can’t imagine there is a writer on the planet who doesn’t get stuck! To get myself humming along again, I go for a drive and listen to light and sweet audio books. My current favorite is the 44 Scotland Street series by Alexander McCall Smith – he is just a delightful writer and Robert Ian MacKenzie is a wonderful narrator. Having to close Facebook and be a grown-up about all this. If you came to my house for dinner, you would have to hope my husband wasn’t home, because he’s vegan and gluten-free. If he’s home, I’d make shepard’s pie with portobello mushrooms instead of lamb, no crust and no butter in the potatoes…if we ate without him, I would make homemade ravioli and my family’s “5 Hour Sauce” We’d have grated cheese, too! I don’t have a typical day. I travel half the month, so my world is decided into “road life” and “home life”. When I’m on the road and have a book due, I set my alarm in the hotel for 5:00 am and write for two hours, then go shoot House Hunters until dusk. I get back to my hotel around 6 or 7, set the alarm for a two hour nap, then get up and write until I’m not writing anything worthwhile or I start falling asleep. I’d like to say I’m one of those writers who writes every single day – but I’m not. A deadline is my motivating factor! After writing five books, I can tell you I definitely have the hardest time writing emotions. Because I think of myself as a “romantic comedy” writer, it’s just easier for me to go for the joke. I have been working on this, though! My characters are “blender people” – a personality trait from one person, a moral code from another, a mannerism from someone else. I don’t sit down to write and say “I’m putting Joe in this book.” or “I met a colorful character at Starbucks, so I’ll add him here.” As I start to create a character, I suddenly HEAR (rather than SEE) the dramatis personae – and then I know exactly who he or she is. My latest effort – WELCOME TO FAT CHANCE, TEXAS – is an ensemble piece, so there are several men to choose from. The theme of the book can be boiled down to “Is it possible in modern day American to pursue the American Dream?” A group of eccentric strangers agree to spending six months in a ghost town in the Hill County of Texas to see if they can do just that. They have lots to figure out about love and life. They attack their mission heroically – if a bit chaotically.) – so I would say all these characters, male and female, are heroes. WELCOME TO FAT CHANCE, TEXAS will hit cyberspace in July, followed by SLIM PICKINS’ IN FAT CHANCE, TEXAS next January. SLIM PICKINS” picks up six months after WELCOME TO FAT CHANCE, TEXAS ends. One of my favorite characters from THE MERCHANT OF VENICE BEACH, Fernando Cruz, comes to Fat Chance on a whim – and becomes part of the group’s latest attempt to save the town. 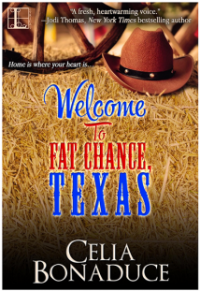 BE SURE TO COME BACK to read more about Celia and WELCOME TO FAT CHANCE, TEXAS on Wednesday’s Karen’s Killer Book Bench. Happy Reading! Links to Celia’s website, blog, books, etc. Thanks, Celia, for sharing your story with us!